We are one of the first and few dental offices in the Kawartha's to offer this revolutionary treatment option for the management of tooth decay, Silver Diamine Fluoride is a topical medicament that is able to treat cavities in a non-invasive, painless, fast, and affordable manner. Some patients who have active tooth decay may be eligible for an alternative treatment that uses Silver Diamine Fluoride (SDF). 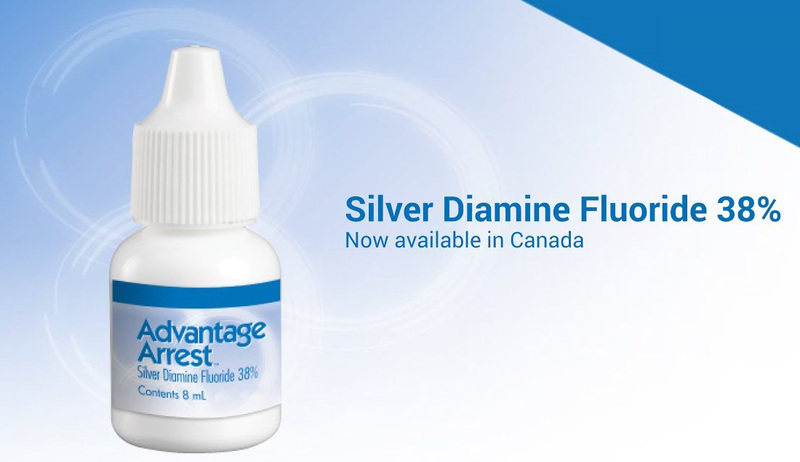 Silver Diamine Fluoride or SDF is a Healt h Canada Approved topical medicament clinically applied to control active dental caries and prevent further progression of the disease. While the ideal way to treat teeth with decay is by removing the decay and placing a restoration, this alternative treatment allows us to stop decay with noninvasive methods, particularly in young children that may not tolerate traditional methods. SDF is a colorless liquid, composed of silver and fluoride, which work together to both strengthen the underlying layers of teeth and to stop present decay from progressing. SDF has the impressive ability to arrest or stop 80% of cavities in as little as one application, but it has an even more fascinating power. When bacteria killed by the silver ions in SDF are added to living bacteria, the silver is re-activated so that effectively the dead bacteria kill the living bacteria in a "Zombie Effect". The reservoir effect helps explain why silver deposited on bacteria and dentin proteins within a cavity have sustained antimicrobial effects. This makes SDF an excellent restorative adjunct since, unlike fillings, it actually helps prevent recurrent decay. Who could benefit from SDF Treatment? SDF could benefit a wide range of patients. This technique is very exciting for young, fearful or pre-cooperative children, special needs patients, and medically compromised individuals who may otherwise require sedation for traditional dental restorations. It is also a great option for nursing homebound elderly patients, those that lack access to care, and those individuals without the insurance or the funds to afford traditional dental restorations. To learn more about SDF or to schedule, your child's next visit to Burnham Dental call 705-743-8385 today!